Major Vijayant Bist of the Jammu and Kashmir Light Infantry was conferred the Kirti Chakra, recognising the valour he displayed in an operation in J&K. 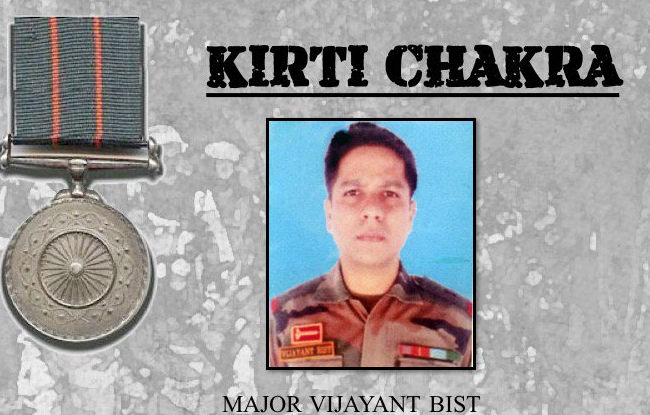 The Kirti Chakra, the second highest peacetime military award, was given to Major Vijayant Bisht of the Army, who led an ambush in Jammu and Kashmir's Uri district and killed two terrorists while saving the life of another soldier. On June 6, 2017 at 2140 hours, leading an ambush in Chorgali Forest of Uri district of Jammu and Kashmir, Major Vijayant spotted infiltration and immediately engaged them. In the intense firefight, some terrorists infiltrated into Goalta forest. At 0500 hours on 07 June, Major Vijayant tracked the terrorists and at 1140 hours engaged them in a fierce firefight. While closing in with the terrorists, first scout of the patrol Rifleman Raj Paul got injured. Under heavy volume of fire from the terrorist, the officer unmindful of his personal safety, crawled forward and pulled his colleague almost 30 meters in an undulating ground behind cover. The terrorists continued to engage the patrol with heavy fire. Undeterred, he regardless of personal dangers, carried out hot pursuit of escaping terrorists. Displaying tactical acumen and extraordinary physical courage, he moved forward and engaged the fleeing terrorist and thus prevented their escape. The officer motivated his team to continue search of terrorists for next 48 hours under adverse weather conditions. His perseverance fructified on 09 June at 1345 hours when the terrorists were sighted again. In ensuing firefight, officer dashed forward, unmindful of terrorist’s heavy fire and lobbed grenades while firing on them. In this daring act he neutralized one terrorist. However, the second terrorist charged towards the patrol and came face to face with the officer. Major Vijayant displaying nerves of steel and raw courage engaged the second terrorist in a close quarter battle and eliminated him at point blank range. For displaying conspicuous gallantry and indomitable spirit, beyond the call of duty for eliminating two terrorists, saving the life of one comrade under heavy volume of fire and gallantly leading his men in neutralising three more terrorists, Major Vijayant is awarded with “KIRTI CHAKRA”.